Regiment/Catrawd: ‘B’ Company 5th Flintshire Battalion Royal Welsh Fusiliers. Service Rank and Number / Rheng gwasanaeth a rhif: Private 26435. Military Cemetery/Memorial / Fynwent milwrol: Merville Communal Cemetery. Ref No Grave or Memorial / Rhif cyfeirnod bedd: Plot: V1.Row: P. Grave: 5. William Hughes was born in Holywell, Flintshire during 1898. The 1901 Census tells us that the family lived in Pwllclai, Brynford, Holywell. The head of the family was John Hughes aged 35, who was employed as a Coal Miner. His wife Mary Hughes aged 31 and their four children – Edward Hughes aged 10, Edwin Hughes aged 6, William Hughes aged 3 and Henry Hughes aged 1 month. Sometime after this Mary Hughes died and John re-married. The 1911 Census shows that the family now lived at 3 Primrose Hill, Brynford, Holywell. John Hughes who was now 46 was still employed as a Coal Miner. His new wife Jane, was much younger than him being 28 years old. They had three children – Gladys Hughes aged 6, Sarah Hughes aged 4 and Benjamin Hughes aged 2 years. Also living with them were four of John’s children from his first marriage – Edward Hughes aged 20, who was also employed as a Coal Miner, Edwin Hughes aged 16, William Hughes aged 13 and Henry Hughes aged 11 years. 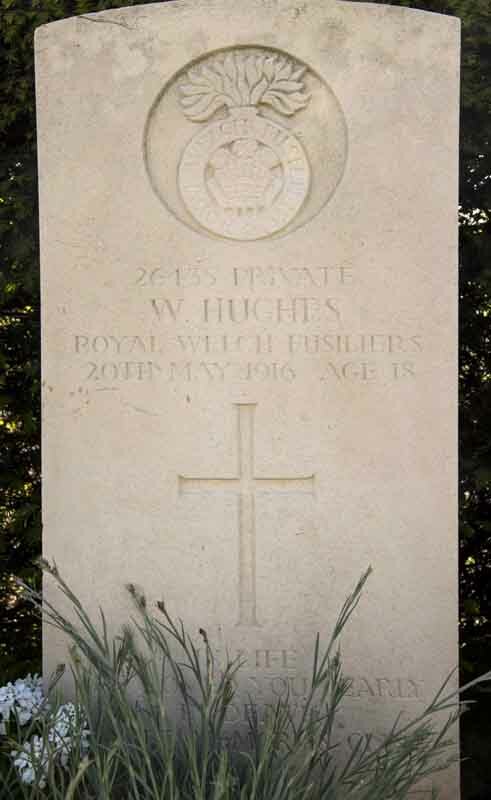 Little is known of William Hughes military service, but on 4 December 1915 he arrived in France with the Battalion on Saturday 4 December 1915. There is a Flintshire Roll of Honour card for William Hughes at the County Archives Office, Hawarden.